Planimetric mapping is the representation of man made or natural features on a map. These features are extracted from image or lidar source data in the form of line, point or polygon vectors. Typical planimetric features include buildings, roads, fences, utilites, vegetation, and water features. Planimetric data are typically collected in 3D so ground features can be duplicated to the breakline layer and used to supplement the digital terrain model in topographic mapping. The plan feature vectors are then converted into 2D to facilitate patterning. Using photogrammetry is still the most efficient way to extract high-quality feature vectors from remotely sensed data. 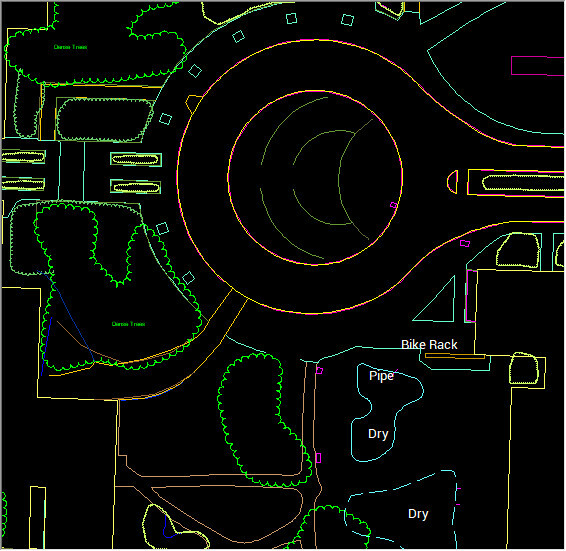 We pride ourselves on producing deliverables meeting our clients' expectations, and have the CAD experience to deliver the vector data in virtually any format or specification desired. Our mapping processes are designed with rigorous QA/QC checks to assure completeness and accuracy.